If you followed at all the recent discussions at Metabunker and a few other sites about a possible weakness in contemporary French cartooning, you'll have come across the title of Christophe Blain's new book, Gus (Dargaud). If you haven't followed that discussion, in the simplest terms it boils down to Matthias Wivel's contention that certain contemporary French comics are over-concerned with form, and suffer from a certain unexamined bourgeois sensibility. The word "trifles" has been used. Having dispatched, finally, all of this year's Angouleme prize winners, I turned my attention to Blain's maligned book with great interest. I eagerly snatched up a copy of the book at Angouleme, where it was being widely hailed as a significant new release. For some years now, of course, Blain has been a cartoonist's cartoonist, the type of artist whose new books are held up by other artists and gleefully dissected. Indeed, on the eve of the Festival this year I stood in a hotel lobby looking at the first page of Gus, reprinted in an ad in a local magazine, with a small circle of big-name cartoonists, each of whom took turns raving about that page. I did too. That page set a tone through the exaggeration of gesture that let us know we were in for a treat. Imagine my surprise, therefore, to have Matthias, the crazed Dane I know so well from the Hotel Mercure bar, rain on my parade. Having now read Gus, I'm here to tell you that he's partially right. 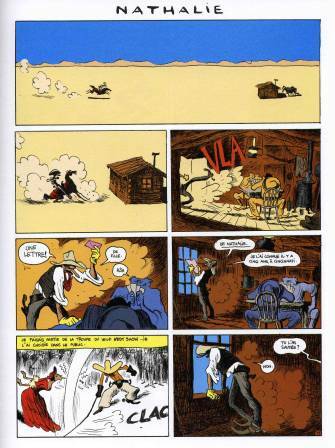 Gus is a semi-parodic western comic about three cowboys (Gus, Clemm and Grattan) and their troubles with women. The first volume, Nathalie, is a collection of five stories. Four of these are 12 pages in length, and the central story ("El Dorado") is 32 pages. When I read the first two pieces I thought that Matthias had lost his mind. I enjoyed the hell out of those stories and thought that they were clever and light and full of good-natured fun. The longer story, however, sapped a bit of my enthusiasm, and it never completely rebounded at the end. I wanted to love Gus, but as it got more serious I will admit that my attention drifted somewhat. The first story is the best in the book. "Nathalie" tells the tale of Gus' horribly unsatisfying relationship with the eponymous female lead. Obsessed with a woman who dangles him on a string, "Nathalie" undercuts the heroic image of the western lead who always gets his woman. 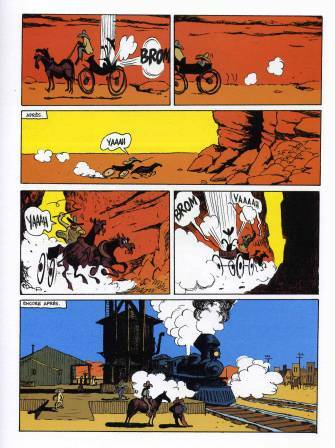 "Gus, Clemm, Gratt", the second story, furthers this demolition of all-American John Wayne-style heroism, depicting the elaborate planning that is necessitated by the hero's desire to leap from a cliff or a train or a bridge onto the back of a galloping horse. This story is played for slapstick, and is genuinely funny. Where Blain styles a fairly simple deflationary comedy, the book works very well. The long central story, however, tilts the book in a direction where it tends to topple under the weight of its pretensions towards a fully fleshed out narrative. When our heroes venture to a city of liberated women, the comedy of manners lacks the zip of the preceding tales. True, there are still great set pieces, as when Gus sings "My Rifle, My Pony and Me," a song made famous by Dean Martin in Howard Hawks' Rio Bravo, or the final pages of the piece in which our trio buries a secret. But the story is also marred by some obvious gags, and story-telling that is less than inspiring. I also found that the return to short humor pieces after "El Dorado" seemed somewhat forced. The upside of Gus, and the reason that I would, despite these reservations, snap up a sequel, is the fact that Blain remains a simply astounding visual artist. His style here is hyper-loose and relaxed, a true joy to behold. The coloring, by Walter, also adds a great deal to the work. It is a wonderful book to look at, no doubt about it. In the end, I have to agree with Wivel that this book is not much more than a trifle. Iâ€™m not sure that it is really trying to accomplish too much, so it is not a grand failure except, as has been noted, for its lack of ambition. I'm not entirely convinced that this malaise is as widespread as Wivel asserts, nor would I want to suggest that it is any more endemic to France than it is to, say, American cartoonists. But I take his larger disappointment. 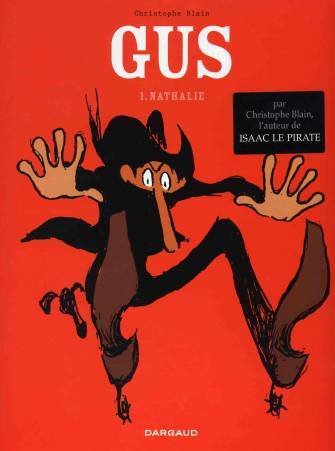 Christophe Blain may be some sort of genius, but Gus is not a brilliant work.